Dryden is the second-largest city in the Kenora District of Northwestern Ontario, Canada, located on Wabigoon Lake. 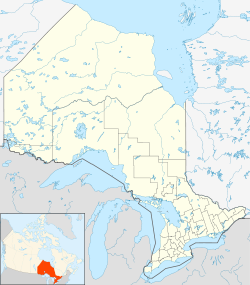 It is the smallest community in the province of Ontario designated as a city. It, and Kenora are the only cities in Ontario located in the Central Time Zone. Dryden is entirely surrounded by Unorganized Kenora District. 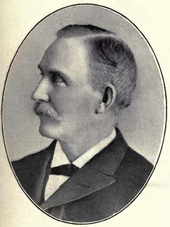 The settlement was founded as an agricultural community by John Dryden, Ontario's Minister of Agriculture in 1895. While his train was stopped at what was then known as Barclay Tank to re-water, he noticed clover growing and decided to found an experimental farm the following year. The farm's success brought settlers from the Uxbridge area of southern Ontario and the Bruce Peninsula and the community came to be known as New Prospect. It became a town in 1910 and a city in 1998 after merging with the neighbouring township of Barclay. Dryden's eastern boundary is located near Aaron Provincial Park on Thunder Lake. Pulp and Paper came to the town in 1910. Today, its main industries are agriculture, tourism and mining. Paper/pulp industries in Dryden were a major contributor in its local economy. In 2008 the mill ceased production of fine paper as the second of two paper machines was shut down. The town came onto the national consciousness in the early 1970s when people in Grassy Narrows became sick with Minamata disease (mercury poisoning). Investigation determined that a chloralkali plant located at the Dryden mill was the source of the mercury in the Wabigoon and English rivers. The town was also the site of the March 10, 1989 crash of Air Ontario Flight 1363, which killed 24 people and led to the Moshansky Inquiry on airline safety. Dryden is located near Wabigoon Lake in northwestern Ontario at 340 km northwest of Thunder Bay. The city is on the territory of the Ojibwe nation[better source needed]. Dryden is also surrounded by the Kenora unorganized district. Dryden experiences a Humid continental climate (Dfb). The highest temperature ever recorded in Dryden was 39.4 °C (103 °F) on 11 July 1936. The coldest temperature ever recorded was −46.7 °C (−52 °F) on 11 February 1914. Population figures for 2001 onwards are for the amalgamated City of Dryden. Population figures before 2001 are for the former Town of Dryden. According to the 2016 Canadian Census, the population of Dryden is 7,749, a 1.7% increase from 2011. The population density is 117.1 people per square km. There are 3,541 private dwellings with an occupancy rate of 94.9%. According to the 2011 National Household Survey, the median value of a dwelling in Dryden is $149,942 which is significantly lower than the national average at $280,552. The median household income (after-taxes) in Dryden is $54,577, almost on par with the national average at $54,089. Most of Dryden is either a Christian (66.8%), or affiliates with no religion (33.0%). 0.1% are Buddhist, and 0.1% practise traditional Aboriginal spirituality. Dryden is known by people passing by as the home of "Max the Moose", Dryden's 5.6 metres (18 ft) high mascot on the Trans-Canada Highway. The city holds an annual Moosefest festival, during which musical performances, children's activities and a fishing tournament known as The Walleye Masters are held. Several annual music concerts are held featuring local musicians. "Come Together" is an annual December 27 or 28th concert, and "Kickin' Country" is a mid April country show. Both featuring local acts. The "Blue Moon Festival" is a daylong event that is held on or near a blue moon calendar event in the summer months. Dryden is home to a variety of arts groups. "Theatre 17" is a community theatre group under the direction of Judith Hamilton that stages theatrical productions, including Noises Off and Tony and Tina's Wedding. The DRAC (Dryden Regional Arts Council) is an artists group that organizes yearly art tours, art shows and also operates a retail store known as Naked North Art Gallery. The Dryden Community Band is a group of musicians who perform under conductor Ryan Graham. Dryden is home to Aaron Provincial Park, which is on the eastern border of Dryden. Dryden is currently part of the provincial electoral district of Kenora—Rainy River. Kenora—Rainy River's Member of Provincial Parliament is Greg Rickford, a member of the Progressive Conservative Party of Ontario. Federally, the city is part of the Kenora riding and is represented by Bob Nault, a Liberal. The region is also served politically by Senator Lynn Beyak (Conservative). The city council is composed of six councillors and a mayor. Currently, Dryden's mayor is Greg Wilson. The city is served by Dryden Regional Airport. Dryden is home to Dryden High School, a secondary school which is part of the Keewatin-Patricia District School Board. Dryden is also home to a satellite campus of Confederation College with head campus in Thunder Bay. Contact North offers distance education through more than 50 post-secondary institutions including McMaster University, Carleton University, and Loyalist College. Dryden has multiple grade schools including New Prospect School, Open Roads Public School and St. Joseph's Catholic School. Dryden has one community newspaper, The Dryden Observer and is also serviced by The Chronicle-Journal, which operates a bureau in Dryden. ^ a b "Dryden A". Canadian Climate Normals. Environment Canada. Retrieved 5 September 2016. ^ Statistics Canada Population and Dwelling counts, census subdivisions (municipalities), 2006 and 2001 censuses, sorted by province, then sorted by type. Dryden has the smallest population for any city (CY). Retrieved 5 September 2007. ^ Mercury Rising: The Poisoning of Grassy Narrows, CBC TV, November 1st, 1970. Accessed 2007-07-26. ^ "Dryden A (Aut)". Canadian Climate Data. Environment Canada. Retrieved 5 September 2016. ^ "Dryden Regional". Canadian Climate Data. Environment Canada. Retrieved 5 September 2016. ^ "2016 Community Profiles". 2016 Canadian Census. Statistics Canada. February 21, 2017. Retrieved 2017-03-15. ^ "2011 Community Profiles". 2011 Canadian Census. Statistics Canada. July 5, 2013. Retrieved 2012-03-15. ^ "2006 Community Profiles". 2006 Canadian Census. Statistics Canada. March 30, 2011. Retrieved 2011-05-20. ^ Extreme high and low temperatures were recorded at Dryden from January 1914 to December 1969 and at Dryden Airport from January 1970 to present. Wikimedia Commons has media related to Dryden. Wikivoyage has a travel guide for Dryden.